This comprehensive demo demonstrates how to use Dynamic Web TWAIN's most popular features: scan images, import local images and PDF files, edit, save to local, upload to database, etc. 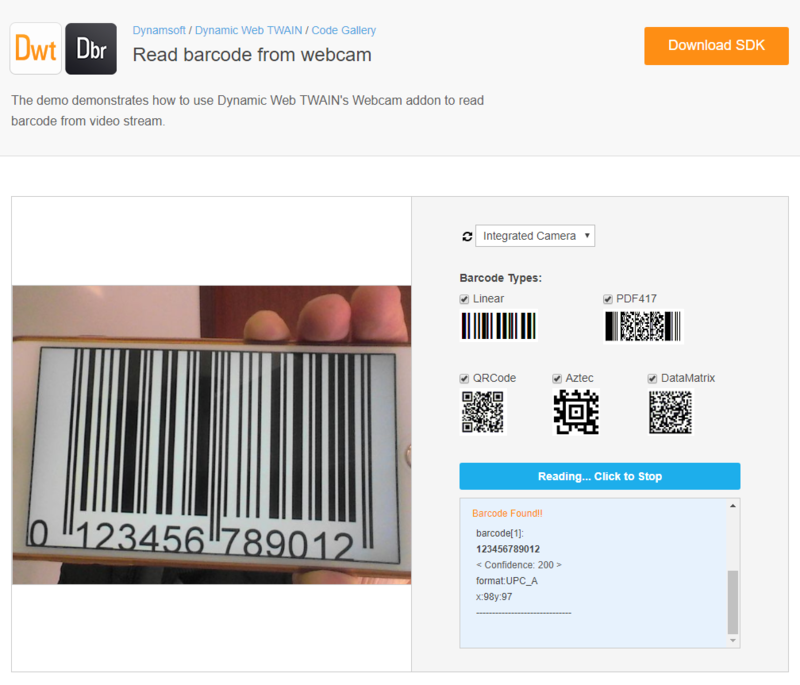 This sample demonstrates the basics of using Dynamic Web TWAIN SDK to scan and upload images in an ASP.NET MVC web application. 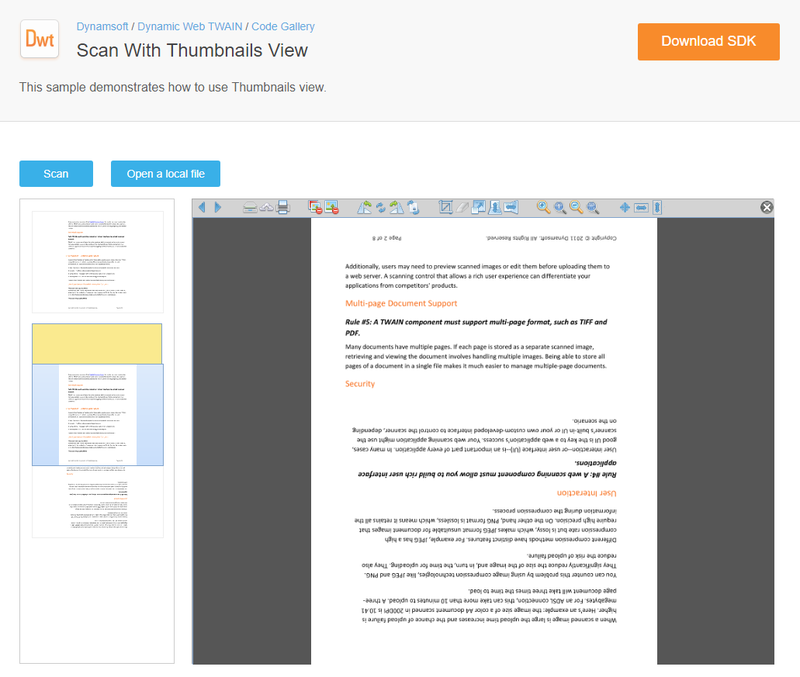 This sample demonstrates how to acquire, edit and upload images in a mobile browser (Android Chrome or iOS Safari) using the Dynamsoft Mobile Browser SDK. 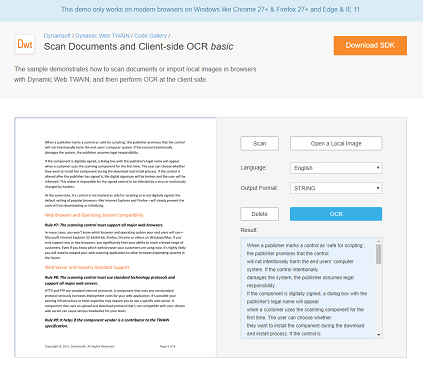 You can use this SDK together with the Dynamic Web TWAIN SDK to build a cross-platform & cross-browser document scanning web application. 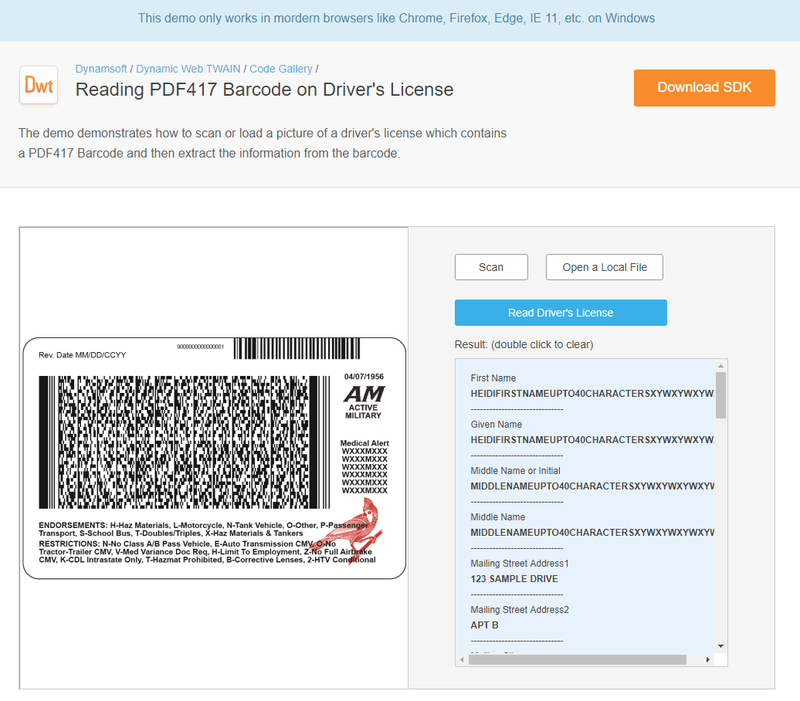 This sample detects barcode information as separators and automatically saves scanned pages into different PDF files. 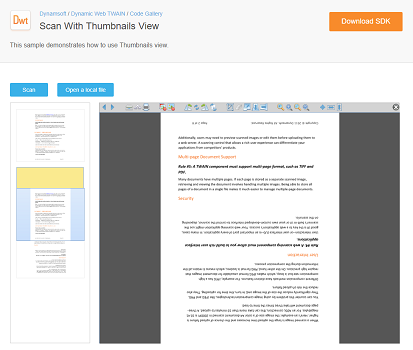 This sample demonstrates how to use web scan with thumbnails. 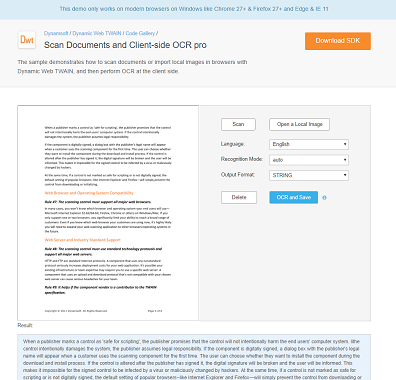 This sample demonstrates how to integrate Dynamic Web TWAIN in a web part of SharePoint. 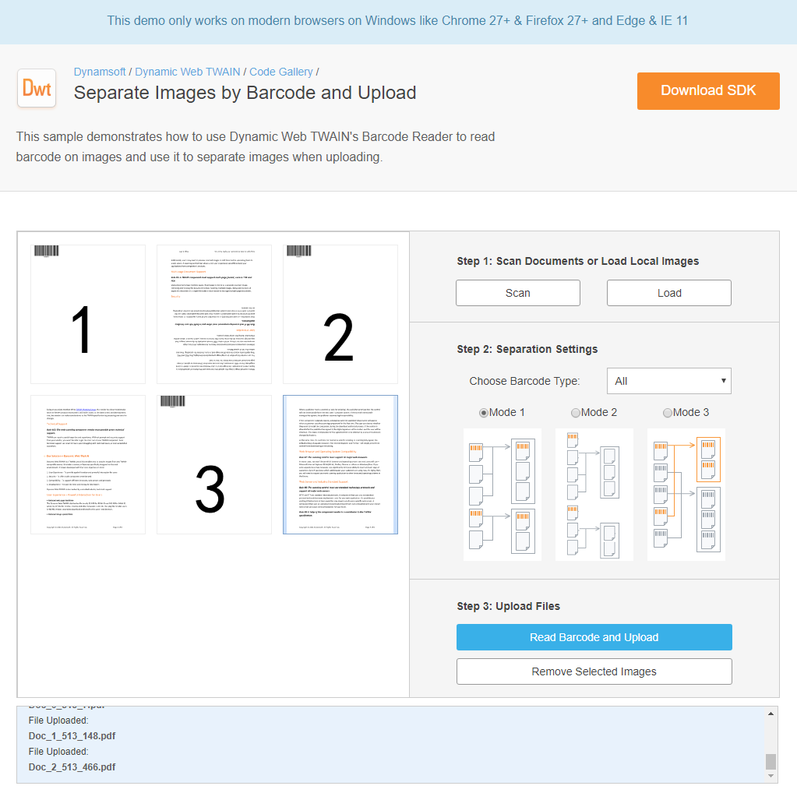 The sample shows how to implement a simple online document imaging and uploading application with Dynamic Web TWAIN & Node.js. This sample demonstrates how to acquire images from scanners and webcams on the same web page. The sample shows how to create a Web application for document imaging and uploading with Dynamic Web TWAIN & Go. This sample demonstrates how to use Dynamic Web TWAIN's OCR Professional add-on to do OCR on the client side. 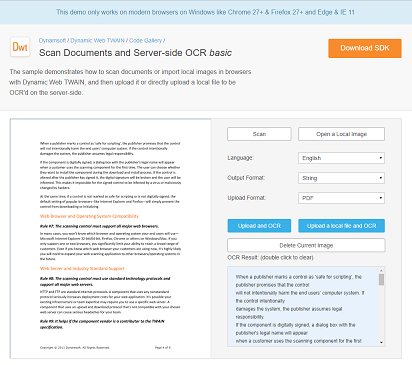 The sample shows how to implement a simple Web document scanning and uploading application in Dynamic Web TWAIN and Node.js with Express and Jade. 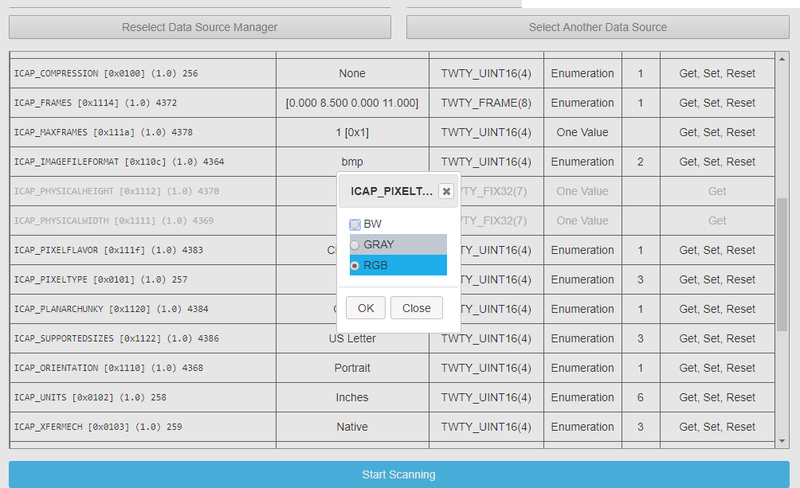 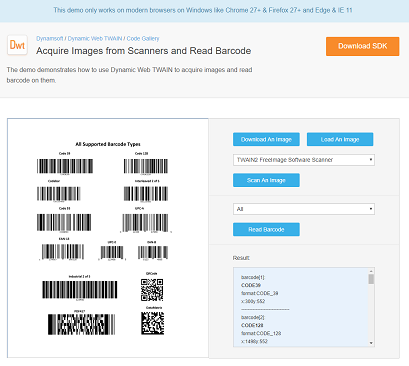 This sample demonstrates how to acquire images from scanners on a PC or from the built-in camera of a mobile device and upload them to a server that runs one of several different script languages. 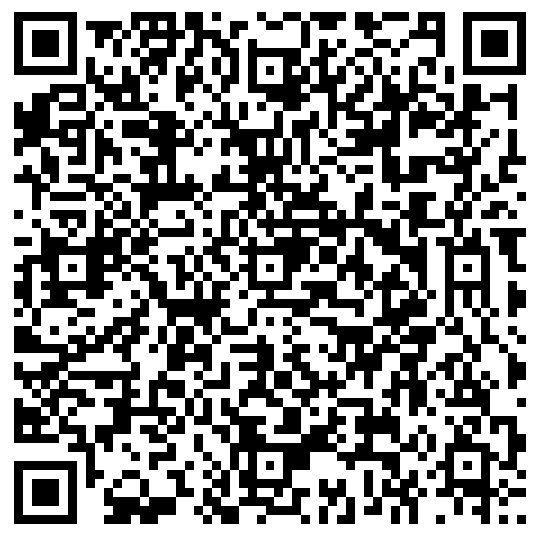 To try it on mobile devices, you can scan the barcode to the left. 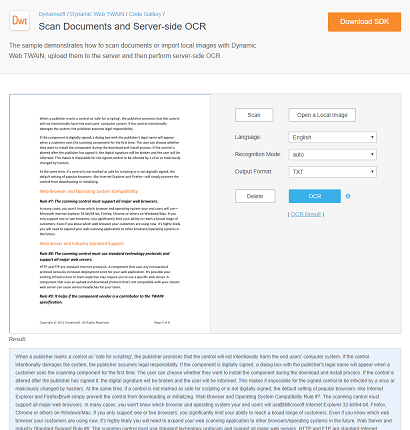 This sample demonstrates how to use Dynamic Web TWAIN's OCR Professional add-on to OCR scanned images on the server side. 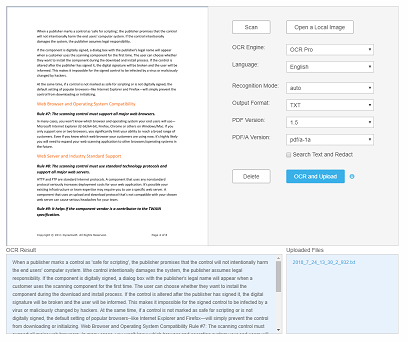 This sample demonstrates how to use Dynamic Web TWAIN's OCR Basic add-on to do OCR on the server side running Java. 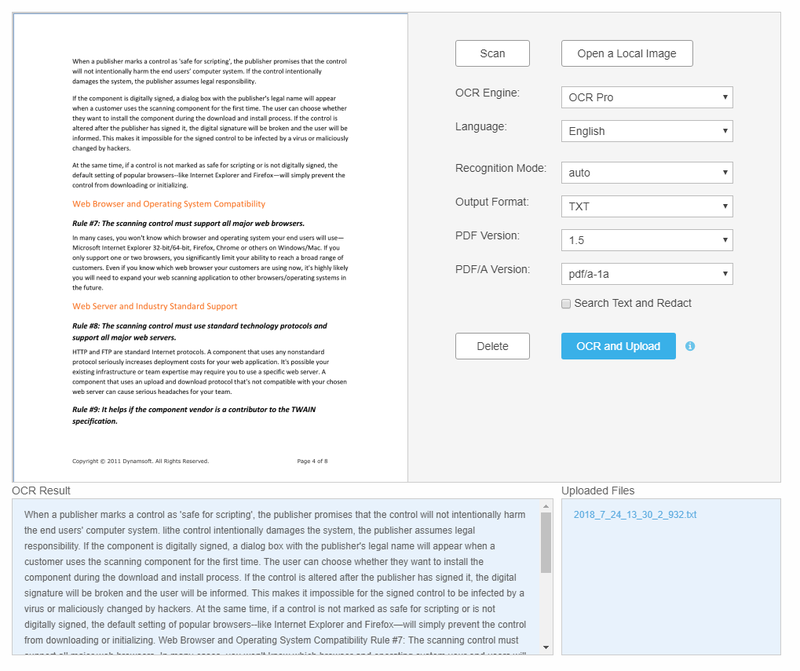 This sample demonstrates how to use Dynamic Web TWAIN's OCR Professional add-on to do OCR on the server side running Java. 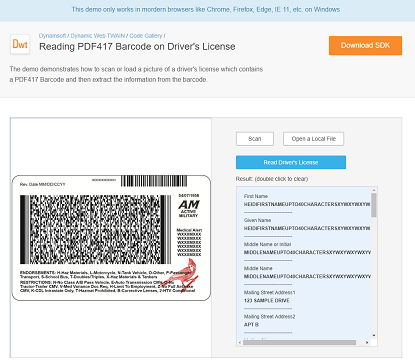 The demo demonstrates how to scan or load a picture of a US driver license which contains a PDF417 Barcode and then extracts the information from the barcode. 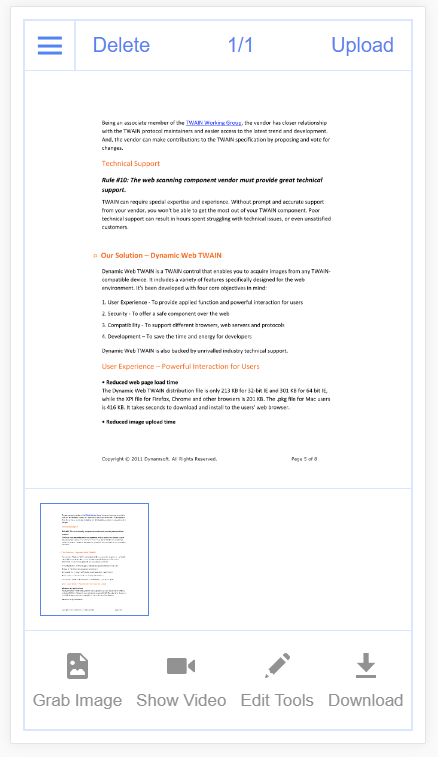 This sample demonstrates how to use Dynamic Web TWAIN in a component of a Angular 5 application. 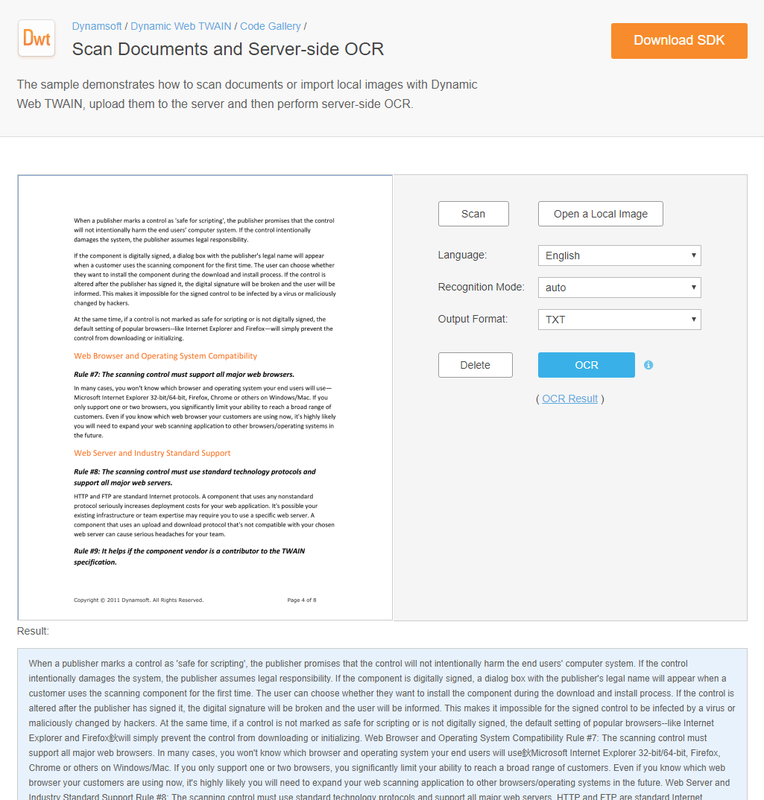 The sample demonstrates how to upload local files to the server, perform server-side OCR using Dynamic Web TWAIN's OCR Professional add-on and return the results. 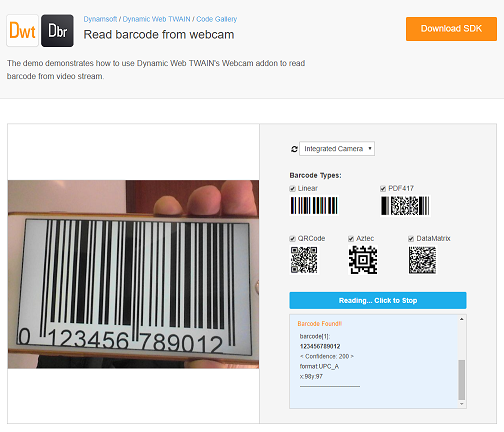 The demo demonstrates how to scan, load or download an image on which there is barcode and extract the information from the barcode. 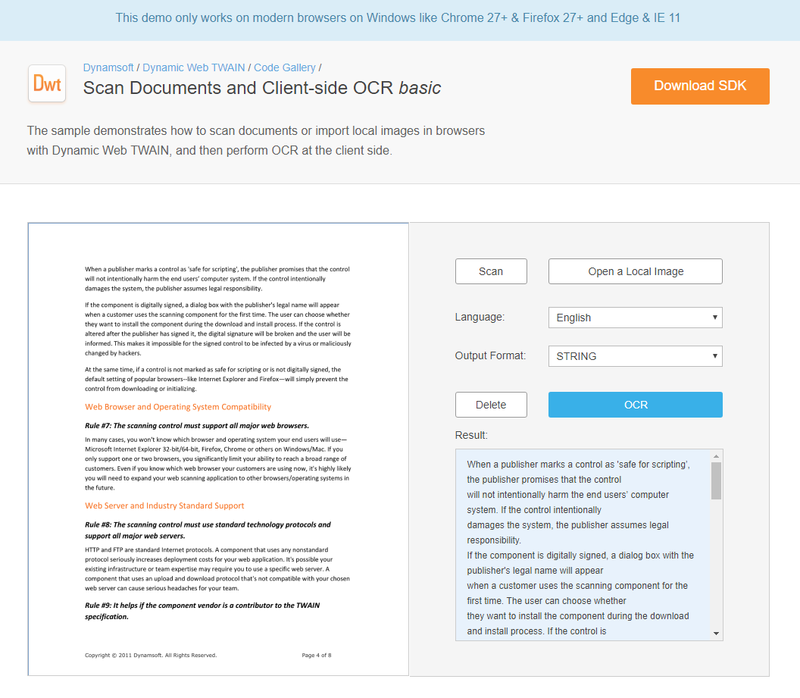 This sample demonstrates how to use Dynamic Web TWAIN's OCR Basic add-on to do OCR on the client side (within client-side browsers).